Recycle – Ted's Trash Service Inc.
Ted’s Trash is extremely proud of our recycling program. 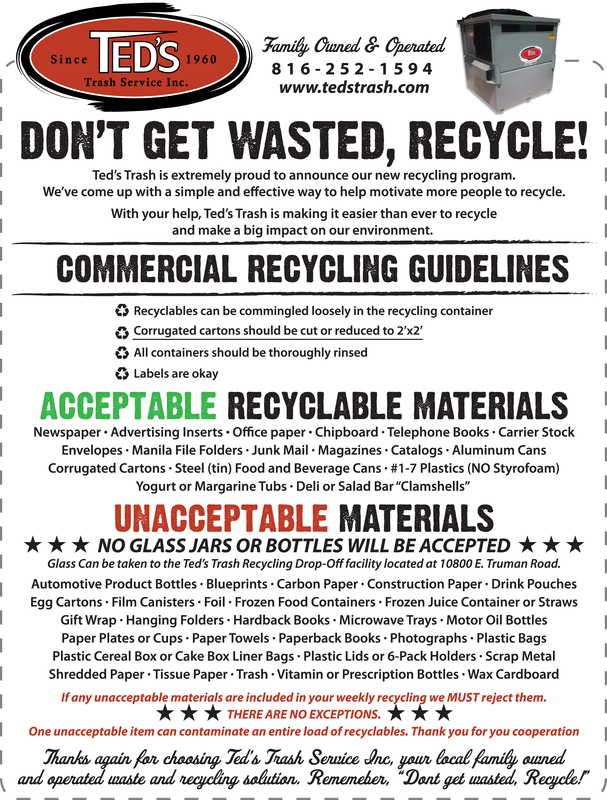 We’ve come up with a simple and effective way to help motivate more people to recycle! With your help, Ted’s Trash is making it easier than ever to recycle and make a big impact on our environment! For your convenience; we will be offering 2 options for recycling. Comingled recyclables accepted: Plastics#1-7, aluminum, tin, paper, magazines, books, and cardboard. No plastic bags, No shredded paper, No styrofoam , No pizza boxes, food waste containers must be cleaned out and free of debris. Your recyclables must be placed in the proper receptacles at the center. Curb side pick-up for recycling takes place every week on your normal pick-up day. Place recyclables at the curb no later than 6am on your normal pickup day. One BIG thing to remember is that glass bottles are NOT accepted curbside! 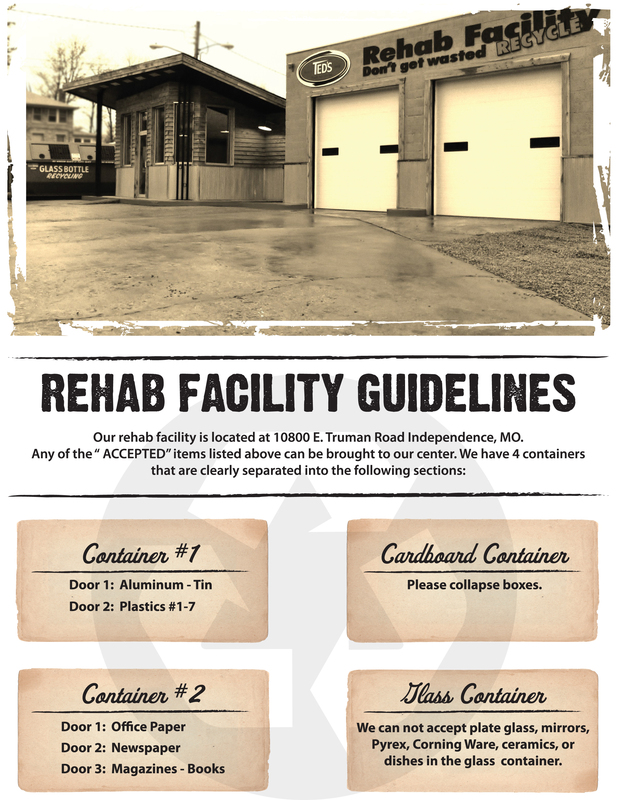 We offer glass bottle recycling at the Ted’s Rehab Recycling facility 10800 E Truman Rd. Please be aware of what is being recycled. Contamination is counterproductive in our goal to reduce waste. Glass can be taken to the Ted’s Trash Recycling Drop-Off facility located at 10800 E. Truman Road. If any unacceptable materials are included in your weekly recycling we MUST reject them. There are no exceptions. One unacceptable item can contaminate an entire load of recyclables. Thank you for your cooperation.